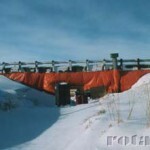 The Tourand Creek Bridge, south of Winnipeg on Highway 59, was selected as the first of its kind to undergo an innovative strengthening technique developed by ISIS Canada. The aim was to increase the strength of the bridge by 30%. Manitoba Highways and Government Services committed $110,000 to test the new technology, anticipating it would be suitable for extending the service life of similar bridges. 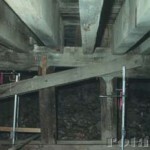 By using the simple, innovative strengthening technique whereby Glass Fibre Reinforced Polymer(GFRP) bars were embedded longitudinally in the stringers and adhered to the wooden beam grooves with an epoxy resin, bridges like the Tourand Creek bridge achieved the same strength as a new structure for less than 15% of the $800,000 estimated to completely replace the bridge. The cost to strengthen each stringer with GFRP bars was $1,500. The benefits of using GFRP bars were that they did not add significant weight to the structure and did not corrode when exposed to road salt. The step by step methodology used for the repair is outlined below. 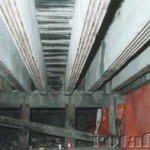 The pictures above show the stringers on the underside of the bridge. 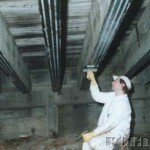 Each beam was 10m long and there was a total of 40 beams. 4 chases, each 10m long x 15mm wide x 15mm deep, were cut using a router. 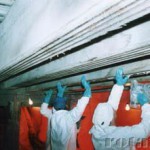 A total of 1600 linear metres of slots were cut into the underside of the stringer beams. 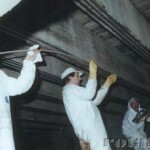 A layer of Rotafix Structural Adhesive (RSA) was injected overhead into each of the slots using a 1 litre grouting gun. 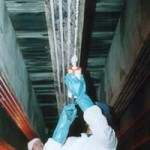 The thixotropic adhesive grabbed instantly. 10mm diameter Glass Fibre Re-inforced Plastic (GFRP) Rotaflex Rods, each 10m long, were then inserted into the slots and then stapled into place. A second layer of RSA was applied to fill the channel ensuring that the slots were completely filled to avoid air pockets. Dr. Sami Rizkalla, President of ISIS Canada and Professor of Civil Engineering at the University of Manitoba explained that the Tourand Creek Bridge was an unprecedented strengthening project. However, it was by no means an experimental exercise. 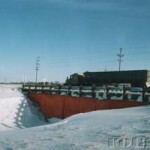 The experimental program was completed much earlier in the McQuade Structures Laboratory at the University of Manitoba. 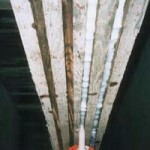 Tests proved that GFRP rods were a feasible solution for strengthening timber bridges. Rizkalla said, “Ductility is dramatically improved and the flexural strength increased by 20% to 50%. For further information about products used in this project or any queries with respect to structural adhesives and on-site bonding please contact us on +44 (0)1639 730481 where one of our technical team will be happy to assist.